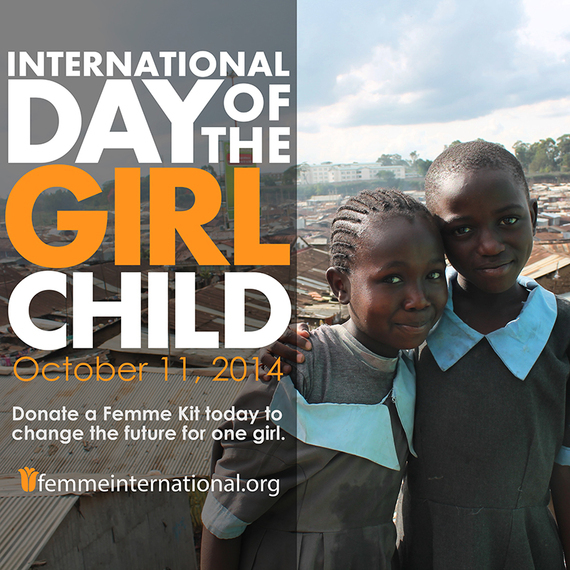 On October 11, 2014, the world will celebrate International Day of the Girl Child. Adolescent girls are among the world's most vulnerable populations, and face a slew of unique and very real challenges. The international community needs to recognize that an empowered woman is the most effective catalyst for sustainable change, and it starts when they are teenagers. Protecting young women from violence increases their odds of completing school, and pursuing a successful and meaningful career! On October 11, 2014, the world will celebrate International Day of the Girl Child, a day designated to promoting the rights of girls, and recognizing the unique challenges they face. The theme this year is all about empowering adolescent girls. Adolescent girls are among the world's most vulnerable populations, and face a slew of unique and very real challenges. In communities where education is not valued, adolescent girls need to fight to remain in school, and are often pulled out of the classroom by their parents. At a very young age, girls are often forced into taking on additional roles within the home, acting as caregiver and breadwinner to their families. Though many improvements have been made for the girl child, it is not enough. Girls are still too often subject to female genital mutilation, female infanticide, child marriage, sexual exploitation and violence, and given less educational opportunities. Girls are often the last of their family members to eat, and are outranked by boys in all aspects of life. Over 60 per cent of the illiterate population of the world are women. Education is too often undervalued in developing communities, viewed as a distraction rather than an opportunity. Despite the fact that many governments provide free primary, even secondary education, families will still have to pay for uniforms and books, and can often only afford to send one child to school -- usually choosing a son over a daughter. It has been proven time and again that investing in a girl sees community-wide benefits. Women are 90 per cent more likely to re-invest in her family. Educating girls, particularly during their teenage years, is proven to be a transformative force in societies around the world -- "it is the one consistent positive determinant of practically every desired development outcome, from reductions in mortality and fertility, to poverty reduction and equitable growth, to social norm change and democratization." The theme for International Day of the Girl Child for 2014 is "Unlocking the Potential of Adolescent Girls," and includes focus on ending the cycle of violence. Young girls have big dreams, and they should be able to take advantage of any and every opportunity that might come their way. The fact that so many millions of girls are prevented from chasing their dreams by avoidable barriers is unacceptable. The international community needs to recognize that an empowered woman is the most effective catalyst for sustainable change, and it starts when they are teenagers. Protecting young women from violence increases their odds of completing school, and pursuing a successful and meaningful career! At Femme International, we are passionate about ensuring teenage girls are able to take advantage of every opportunity that might come their way. By using innovative health education, our program keeps girls in school every day of the month. Help us celebrate International Day of the Girl Child by donating a Femme Kit, and providing a Kenyan schoolgirl with the resources she needs to stay safe, healthy and in school. Girls are the future, and on October 11, we celebrate the achievements of young women around the world! Join the conversation on Twitter using #DayOfTheGirl.